Sparkle Creations First Anniversary Release and Hop! Hello and Welcome to the Sparkle Creations Rubber Stamps 1st Anniversary Hop! Not only are we here to help Sparkle celebrate a year of SCRS, but we are also officially releasing 4 new SCRS images this month -- Backpack Oliver, Bookworm Ruby, Hula Lucy and Ukulele Josh.. But wait, there's more.. we are also releasing 2 new Karber Rubber Stamps -- Rainbow Leslie and Reading Millie! They are ALL available in the store now! For my project today, I have used my favorite from this release (although I LOVE them all) Backpack Oliver! I found these cute little bags at Joanns and thought they would be so fun to decorate for small gifts. I used some dp from the My Mind's Eye Stella Rose Hattie collection and some fab ribbon from Really Reasonable Ribbon. What's a hop without prizes? We've hidden TEN single stamp prizes along the way and one lucky winner will win the ENTIRE July release! All you need to do is leave some love at every stop along the hop.. You have until 11:59 PM EST on Sunday to leave comments for a chance to win! Winners will be announced on the SCRS blog on Monday. Good luck to all and Happy Hopping! I like this project a lot because I AM a teacher! :) It would be very sweet if I had a student (or a student's mom, hehe) make this for me because time and effort was spent on it. That's such a sweet gesture! Like your idea of using it on the small gift bags. Definitely a sweet gesture for the teachers. This is fabulous. I'm with Rachel, I'm a teacher too and would love to get something like this from one of my families. Fabulous project!! Great coloring and shading. Such a fabulous and darling bag! So beautiful Kerri,I love the image and the colours. What a wonderful idea. So adorable. awesome gift bag! so cute! What an amazing idea! 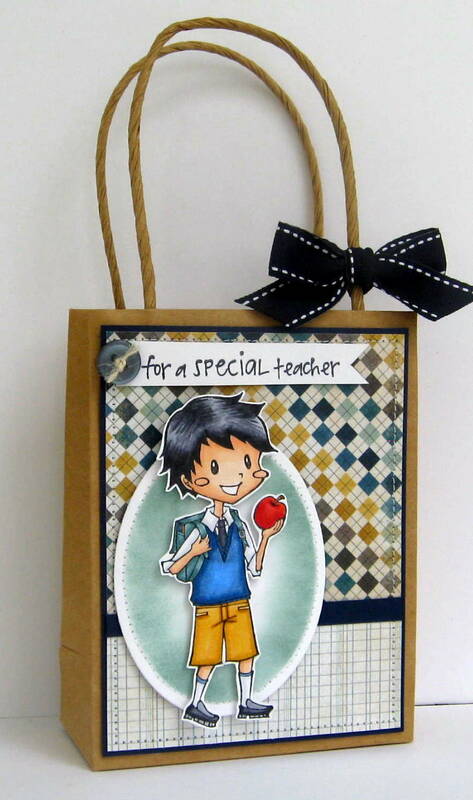 What teacher wouldn't love a little giftie in such a sweetly decorated bag. I love this sweet little bag, Kerri! Especially love how you decorated it with the perfect papers and sweet Oliver! Love the Bag!!!!! The combo of papers,colors and coloring is awesome. Fabulous gift bag! Love the adorable Oliver image! Great dp and layout too! Love it! This is seriously too cute. I love it. Great choice of papers. What a great gift idea. Very cute ! So cute girl, perfect little gift bag for a teacher! So adorable!!! I think I will do a little bag like this for my daughter's teacher this fall :) Thanks for the inspiration! What a great idea!! Thanks you so much for sharing! Awesome job! Too cute! As a teacher, I would be blown away to get something like this! What a gorgeous bag Kerri! I love the image and your colouring. Brilliant idea for a gift bag - great job! So cute! Love the DP with this image! He's my favorite! I love the colors, and the papers, and the coloring - it is all perfect! OMG, I want this bag, it's the cutest ever!!! Cute, cute, cute! Love that paper...I missed it at my LSS. Fab teacher gift. He's so cute. Great gift bag! Love how you used this stamp. Oh - I love making gift bags and receiving them too - who am I kidding. I'm a teacher and this would be so adorable to receive! Thank you for yet another adorable teacher gift idea!! ooooh, what a fun and super cute project, Kerri! Such a cute idea Kerri! Look awesome! What a beautiful and clever way to decorate a paper bag using that adorable Backpack Oliver! Great job!!! Wow! Your project is fabulous, Kerri! You really brought to life Backpack Oliver! So proud to be in one team with you! Fabulous! Gosh, I love this! too cute! fab project! love it!